Michael Grange of Sportsnet.ca brought up an interesting idea for the Toronto Raptors in a column he wrote for the website yesterday afternoon. He believes that with the regular season being shortened to 66 games due to the Lockout, that this may be the perfect time for the Raptors franchise to “tank” in order to secure a high pick in the talent-loaded 2012 NBA draft. “Tanking” is such an ugly word in professional sports. No one likes to lose, especially on purpose. No fan would want to pay their hard-earned money to go watch a team who has little desire to put W’s in the win column. Here’s the thing though. Tanking or not, the Raptors won’t be winning a lot of games this year anyways. They just aren’t good enough with the talent roster they have to be competing with the elite teams in the NBA. That is why tanking this season isn’t that crazy of an idea. The Raptors have a lot of good, young pieces on the team. That is all they have though. There are no Superstars. There are no All-Stars. Hell, I don’t even they have a true leader. Toronto perhaps snagged itself a diamond in the rough with Jonas Valanciunas in last years draft, but he won’t be on the court for the Raptors until at least the 2012-13 season, so the word is still out on him. Speaking of Jonas, just because he is from Europe, doesn’t mean the guy can’t play Basketball. He is a young, talented big-man who can be molded into the Center of the future for the Toronto Raptors. Give him a chance to play before you start labeling him Bargnani 2.0. Just imagine, going into next season with Valanciunas coming over from Europe, as well as having a Top-5 pick in one of the deepest drafts in recent memory. This draft is stock-full of talented, All-Star caliber players like Connecticut’s Andre Drummond, Harrison Barnes out of UNC, and Kentucky’s Anthony Davis. Now the one road-block that may present a problem for the Raptors is if the NBA decides that all draft-eligible players must be 20 years of age, and have spent 2 years in the college system. That would drastically lower the talent-pool of the 2012 draft, as freshman like Drummond and Davis would have to stay in school for one more year. The Raptors need that high lottery pick and they need that pick to be great, not good. If you look at some of the names that have been drafted with a top-3 pick in recent years (Lebron James, Dwight Howard, Blake Griffin, John Wall, Derrick Rose, Kevin Durant), then you can see what drafting a star-player can do for a franchise. This is how you rebuild in the NBA these days. Drafting well is the most important step into re-establishing a team and getting back into playoff contention. That is not to say that Toronto hasn’t drafted well in recent years. Demar DeRozan and Ed Davis are two young, quality players who should be major parts of this teams future. However, neither guy really has that star quality about them to be a Chris Bosh or a Vince Carter for this franchise and take them deep into the playoffs. Andrea Bargnani has also turned out to be a good player for the team, but he certainly hasn’t played up to his number 1 draft pick in 2006. Having “Il Mago” as your number one option isn’t good enough in this league. The Raptors franchise can’t keep dwelling in mediocrity forever. The fans of the team are loyal to the end, but their patience is wearing thin. When Chris Bosh bolted for sunnier days last season, he took a lot of the overall appeal of the team with him. He may not have been a mega-star like a James or Wade, but he was a star none-the-less. That is what this team needs now. With the new CBA, a star-caliber player won’t be falling into the lap of the great city of Toronto anymore. If you want to win and establish players, you have to make it happen on your own. The 2012 draft is as good a time as any to start. Those players are just too good to pass up. The 2011-12 season? Just tank it. You won’t regret it. What do you think? Should the Toronto Raptors tank this season in order to get a high draft pick? What do you think about tanking in general? Leave a comment below if you like. 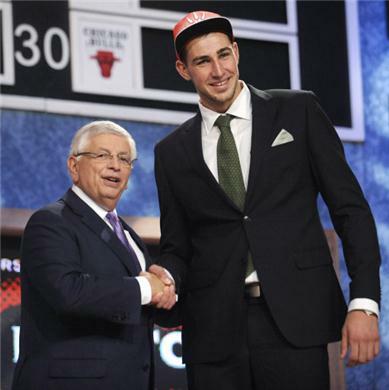 This entry was posted in NBA and tagged 2011, Andrea Bargnani, Basketball, Demar DeRozen, Ed Davis, Michael Grange, NBA, Sportsnet, Tanking, Toronto, Toronto Raptors. Bookmark the permalink. I agree that Toronto’s only true option at rebuilding a quality franchise is through draft picks, but I just can’t, as a true fan of all sports, condone tanking. If we’re going to create a team that can last and be respected not just by the Raptor fans, but by the other teams in the NBA and the officials, because let’s face it they truly control the outcomes of games, we need to show everyone that when we hit the floor we are there to win. Sure we may not win that many games and we may not get the best pick in the draft, but who is going to sign a long term contract or even want to play on a team that may decide to tank the season to get the next big thing. I know I wouldn’t. amazing work, keep up the great site.